Haag-Streit UK (HS-UK), the leading manufacturer and distributor of gold-standard optometry and ophthalmic equipment, is delighted to be able to offer a FREE LED upgrade for any tungsten BQ 900 slit lamp, with the purchase of a Haag-Streit imaging module. An LED enhancement is quick and simple to perform...This offer is a fantastic opportunity for anyone who is thinking of purchasing one of the remarkable Haag-Streit imaging modules to upgrade their slit lamp, free of charge. Any customer who purchases either an IM 900 or IM 600 imaging module before the 1st November 2016 will be entitled to the free upgrade. Upgrading to LED has many benefits. Tungsten bulbs produce ‘hot-spots’, meaning that the level of detail available to view is reduced. The illumination of tungsten bulbs is poorer than LED, meaning when upgraded, the view of the anterior segment and retinal detail are enhanced. The viewing of this finer detail can lead to improved clinical diagnosis. The average price of a tungsten bulb is currently £61 so when bulbs blow this can be costly, as well as causing equipment down-time. Upgrading to LED avoids the need for bulb changes and lasts 150 times longer, offering a 60% energy saving compared with tungsten bulbs. The IM 900 and IM 600 imaging modules provide a fully-integrated, compact imaging solution. They offer outstanding image quality, even under difficult lighting conditions. 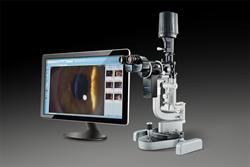 The imaging modules boast features which make slit lamp imaging more convenient than ever before, including easy image capture and simple network integration. For more information on the LED upgrade or either of the imaging modules, please call Haag-Streit UK on (01279) 883807, or email ledupgrade@haag-streit-uk.com.